Electrochemistry for Technologists introduces the technologist to the principles and applications of electrochemistry. Topics range from primary and secondary batteries to fuel cells and corrosion. Some applications of electrochemical methods are considered, including electroplating, forming, polishing, and machining, as well as metal extraction and refining. 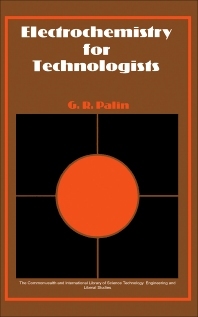 This book is comprised of eight chapters and opens with a brief overview of the fundamental concepts in electrochemistry, paying particular attention to atoms, molecules, and ions as well as ionization in aqueous solution; dissociation of water; electrolytic conduction; electrode potentials; and electrolysis. The reader is then introduced to primary and secondary batteries and some of their applications, followed by a discussion on fuel cells, their construction and classification, and how they produce electricity. Subsequent chapters focus on corrosion and corrosion protection, along with a number of applications of electrochemistry such as electroplating, electroforming, electropolishing, and electrochemical machining, as well as extraction and refining of metals. This monograph will be a valuable resource for chemists, electrical engineers, and technologists.